A year of change in Davis Cup begins this weekend when 12 qualifying ties are held around the world, feeding in 12 winners to the 18-team grand finale in Madrid next November. There are two main innovations in the ties: all matches are two-out-of-three sets and the tie is played over two days – a Friday and a Saturday with the doubles before the two singles on the second day. It’s a major reshuffling of the Davis Cup deck which will be further modified when the 18 nations gather in Madrid the week of November 18th. Canada is facing Slovakia indoors on clay in a qualifier at the National Tennis Centre in Bratislava beginning on Friday. The tie is being played in a permanent tennis arena that seats between 4,000 and 4,500. Normally there’s a hard court in the stadium but the Slovaks basically thought top Canadian Milos Raonic would be playing and wanted a surface to blunt his big game. The reviews for the red clay court so far have been excellent – even if it may have slowed down a bit after some more top dressing was added Tuesday. But it’s still relatively quick and the Dunlop balls being used are also fairly fast-paced. Felix Auger-Aliassime is familiar with the facility – he played a Challenger event at the site two years ago on hard courts and lost in the second round to Slovak veteran Lukas Lacko. The No. 106-ranked Auger-Aliassime is expected to be the Canadian team’s second singles player, with No. 25 Denis Shapovalov leading the way. There’s a bit more uncertainty, or at least there appears to be, with the Slovaks. While No. 38-ranked Martin Klizan is a given as the No. 1 player, captain Dominik Hrbaty is being coy about his No. 2. It’s likely to be No. 255-ranked Norbert Gombos, 28, who has been as high as No. 80 in 2017. “Martin Klizan is clearly No. 1,” said the 41-year-old Hrbaty, who happens to be a rare player with a positive (2-1) head-to-head advantage against Roger Federer. “I would even say that by far he is the best clay-court player here in Bratislava. So our hopes will be clearly resting on his shoulders. “We still have to put some thought into the nomination of No 2. But at this point I shall disclose no further. The Slovaks’ best No. 2 choice Josef Kovalik, ranked No. 89, has undergone wrist surgery and is not available. In addition to the singles, it appears Auger-Aliassime and Shapovalov are a good bet to play Saturday’s doubles in the absence of doubles stalwarts Daniel Nestor, retired, and Vasek Pospisil, out with a back injury that required surgery. The other option would be Peter Polansky, in singles and/or doubles, with playing captain Dancevic, 33, a very long shot to suit up. On Tuesday the Slovaks had Igor Zelenay (on right), No. 40 in doubles, and Filip Polasek (left), No. 140, practising together. It’s a sight very few people had ever seen before – a clay court being dragged and brushed by man on a motorized bicycle. That’s how the clay court at the National Tennis Centre in Bratislava is being prepared for Friday/Saturday’s qualifying round tie between visitors Canada and the host Slovaks. It’s hard to believe 21-year-old Naomi Osaka was ranked No. 72 in the world a year ago and has now won 14 Grand Slam matches in a row and two titles. It has not been easy to follow up a first Grand Slam victory with a title at the very next Grand Slam event – not since Jennifer Capriati in 2001 – but Osaka did so convincingly, beating Petra Kvitova 7-6(2), 5-7, 6-4 in the final. Both finalists are sympathetic figures so it was difficult to cheer for one over the other. But, except for a nervy patch when she served for the second set, Osaka was the better player and deserved the victory. All hail Novak Djokovic. The 31-year-old Serb pretty well ruined any real excitement in the men’s final by playing so well, making the outcome almost a foregone conclusion after he broke Rafael Nadal in the second game of the final. There will be speculation that Nadal was in injured or limited in some way but Djokovic’s recent mastery over the Spaniard on hard courts – an 8-0 run with 17 consecutive sets won – has to be a factor. There’s no question that for eight years since 2011, Djokovic has been the best men’s player in the world – over that time winning 14 Grand Slam titles to eight for Nadal and only four for Federer. For the eight preceding years from 2003 to 2010, Federer was clearly the best player, winning 16 Grand Slams compared to nine for Nadal and just one for Djokovic. Milos Raonic: It looked like one of Raonic’s best Grand Slams when he was about to face Lucas Pouille in the quarter-finals with Novak Djokovic likely looming the semi-finals. But it all went ‘pear-shaped’ when he lost to the Frenchman in four sets, seemingly bothered by a right knee issue that originated back in late 2017. It’s a shame because the ending tends to overshadow just how well he played in the first four rounds. It says here he would have gotten more games against Djokovic than Pouille (4) and Nadal (8) had he made the semis. Denis Shapovalov: It was a good Australian Open for the 19-year-old. He went one round better than 2019 and then came up against an irresistible force in Djokovic. He can solace in that he is one of only two players (Daniil Medevedev) to take a set off the now seven-time champion. Bianca Andreescu: It was never going to be easy playing the qualifying at Melbourne Park after her sensational run at the WTA event in Auckland – wins over Caroline Wozniacki and Venus Williams and a good battle with Julia Goerges in the final. But she got through the qualifying, with a little help from a couple of retirements, and toughed out a tricky first round against 16-year-old Whitney Osuigwe before, playing on fumes against a crafty opponent Anastasija Sevastova in the second round, she was beaten 6-3. 3-6, 6-2. Carrying her form over to the title at the $125K WTA event in Newport Beach, California, last weekend was wildly impressive and a sign of the considerable potential she has. Genie Bouchard: It was a good but not great trip Down Under for Bouchard. Reaching the quarter-finals in Auckland and going out after holding a match point against Goerges was encouraging as was winning the doubles with Sofia Kenin. Unfortunately the doubles prevented her from playing the qualifying for Hobart, which Kenin wound up winning. She had a solid win, as she should, over Peng Shuai in the first round of the Australian Open before facing the raging storm that was Serena Williams through the first three rounds. As for her loss to Andreescu, 6-2, 6-0 in the quarter-finals in Newport Beach last week, it remains a mystery. As well as Andreescu played, why was it such a poor effort from her side? Gabriela Dabrowski: The sage doubles philosopher Daniel Nestor always said that most doubles matches come down to a few points. At the 2019 Australian Open those points didn’t go Dabrowski’s way. In regular doubles, she and partner Xu Yifan were upset by a good Czech team – Barbora Strycova and Marketa Vondrousova – in the first round. In the mixed, as defending champions, she and Mate Pavic lost a close one 6-1, 4-6, [11-9] in the quarter-finals to Maria Jose Martinez Sanchez and Neal Skupski. Leylah Annie Fernandez: The 16-year-old made it to the final as the 4th seed, and wound up losing to top-seeded Clara Tauson of Denmark 6-4, 6-3. Fernandez won over many in the crowd during the presentation ceremonies when she was accidentally introduced as an American. She politely, and with a touch of humour, corrected the master of ceremonies. 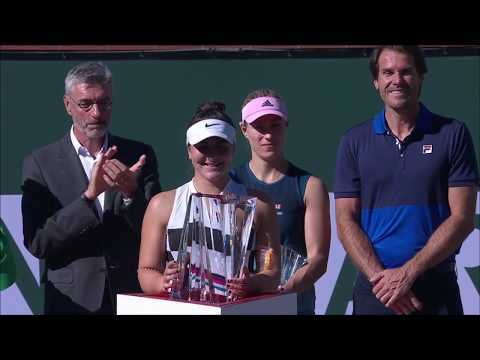 It was a first junior Grand Slam final for the left-handed Fernandez following a semi-final showing at Roland Garros last year.